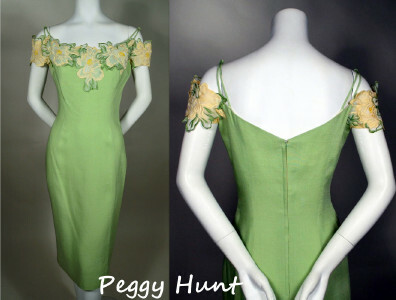 50's vintage off shoulder sheath wiggle dress. Light lime green rayon linen and embroidered organdy. Off-shoulder sheath afternoon dress. Die-cut embroidered organdy flower encircle shoulder and neckline. Deep scoop back. Double knotted linen spaghetti straps. Fitted bodice through pencil skirt with princess seaming. 14 inch metal zipper center back. Approximate bodice length, measured from shoulder to waist seam - 14 1/2"
Skirt length, measured from waist to hem edge - 27"
EXCELLENT condition. Shows just slight wear and faint press mark at hem.